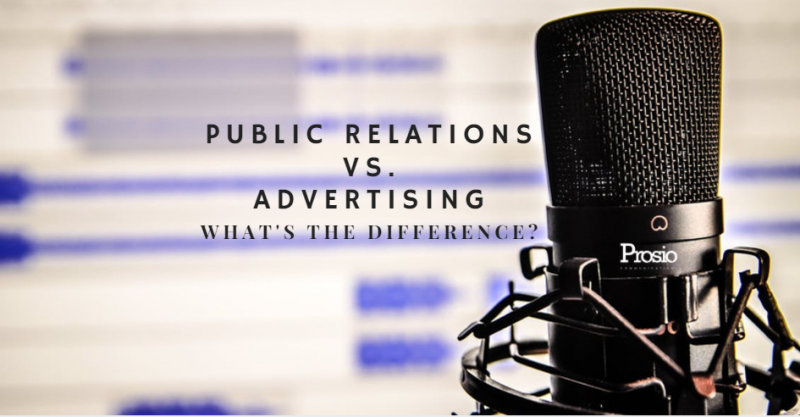 Public Relations vs. Advertising – What’s the Difference? What do you think of when someone tells you they do PR for a living? What about when they tell you they work at an advertising firm? At least in pop culture, both of those jobs evoke visions of swanky urban offices in high-rise buildings, high-pressure deadlines and groundbreaking creative campaigns. While the fancy offices are mostly a pop-culture myth (they certainly exist, but there are as many if not more PR and advertising firms that exist in modest buildings located in business parks), it’s true that both industries have their stressful moments, and that it takes a lot of creativity at both the individual and collaborative level to stay ahead of the curve. Paid vs. Earned Media: This is a core difference. Advertising focuses entirely on getting a message out via paid media – commercials, billboards, digital ads, etc. – while PR focuses all of its effort on publicity, or “earned media” through news releases, editorials, press conferences, etc. Control vs. Influence: When you run an ad campaign, you control the message, the creative, and the location for everything. In PR, you rarely have control – an important press conference could lose media coverage due to unforeseen events, or worse, your message could be covered in a way you didn’t intend. No one is obligated to listen to your message or cover it the way you’d like, which is where the pitching and spin are important. A good advertising professional has to make excellent use of the space they bought or it’s wasted; a good PR professional has to make sure press opportunities aren’t wasted by generating interest and coverage, and conveying the message in the right way. Short-term vs. Long-term: Ad campaigns don’t have long shelf lives. When people become overexposed to creative and calls to action, they begin to lose interest. By contrast, public relations is focused on brand and reputation management in the long-term. Public Trust v. Guaranteed Exposure: The main purpose of advertising is to raise awareness of a brand or a message; a good PR campaign works to add another layer onto that awareness by making a brand or message credible. Generally, people know to take advertising and ad claims with a grain of salt – even though the ads may not be dishonest, they’ve got a goal or a motive to accomplish. On the PR side, the goal is to obtain coverage from unbiased 3rd-party sources, such as news outlets (although more recently, this has been brought into question – but we’ll save that for another blog post!) This kind of exposure usually comes with more public trust, which is why positive press is PR’s holy grail. A good communication strategy doesn’t operate in a vacuum. Even though they are opposite in many ways, PR and advertising campaigns often strengthen each other when they operate in tandem. Even though the public can be skeptical of ads, some paid advertising can lend additional credibility to a good PR campaign by giving the impression that an organization or cause is mainstream and legitimate enough to advertise in the normal channels. In the same vein, since people are less likely to trust paid advertising, a good PR campaign can strengthen and bring additional, widespread awareness or positive exposure to a stellar advertising and creative campaign. We hope we’ve cleared things up! If you’re in need of some guidance in either of these areas, you know where to find us. By Aaron Samson| 2017-08-30T23:18:32+00:00	August 30th, 2017|Categories: Advertising, Communications, Public Relations|Comments Off on Public Relations vs. Advertising – What’s the Difference?